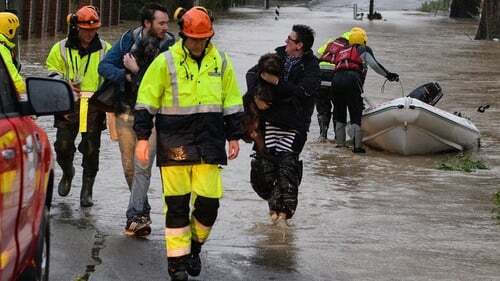 The New Zealand Defence Force mobilised additional troops overnight, bringing its total deployment to at least a dozen trucks and 140 personnel to provide emergency services and help rescue those trapped by rising flood waters. Christchurch declared a state of emergency after the Heathcote River burst its banks and flooded southern parts of the city this morning, becoming the fourth area to do so after a severe weather event which has lashed the south island over the past 24 hours, causing widespread flooding. Local media reports that about 1,500 people in settlements further north were told to leave their homes as water levels rose overnight, while more than 100 homes were evacuated outside of Dunedin, the south island's second largest city. Emergency services are now focused on the Taieri River near Dunedin, after predictions it would rise to near-record levels. In addition to Christchurch and Dunedin, states of emergency are ongoing in Timaru and Otago. New Zealand Prime Minister Bill English took to social media to address the nation. "My thoughts are with those affected by the weather events in the South Island. Please follow official advice and take care of each other," he said on Twitter. The country's weather bureau said rivers in affected areas remained at very high levels this morning, after some areas were hit with more than 200 millimetres of rain in 24 hours. It predicted that rain should gradually ease throughout the day, however it said cold temperatures and blizzard-like conditions could affect those at higher levels.